When I started planning our trip to Nashville, I reached out to my friends who eat like I do (gluten-free and vegetarian) and also to my friends who have recently visited or live in the Nashville area. 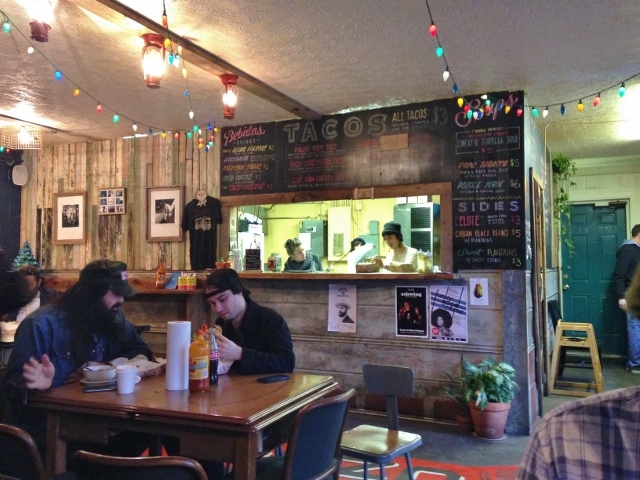 The one spot that popped up on nearly all of the lists was Mas Tacos Por Favor in East Nashville. Right before we left town, I ran into a local restauranteur who was wearing a Mas Tacos t-shirt; she swooned about their eats. That sealed the deal. The shirt, with an image of the 1974 Winnebago that first housed Mas Taco, my love of tacos, the recommendations of many friends…well, we just had to go there! 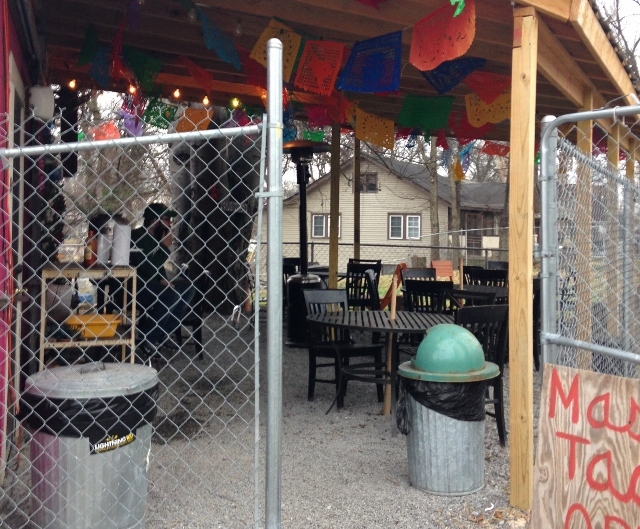 Mas Tacos Por Favor is located in East Nashville in a what appears initially to be a small building. 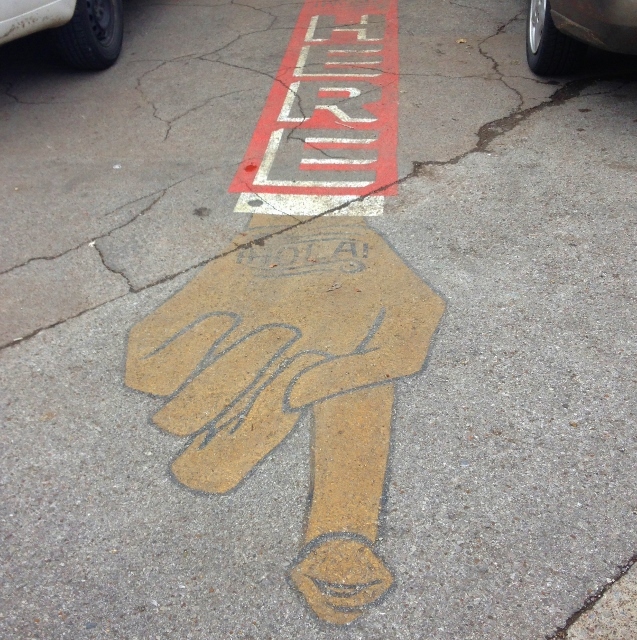 Painted on the sidewalk outside the front door is a sign, indicating where you should line up to wait for your turn ordering at the cash-only counter. Once inside, you’ll order from what’s available in the moment from the plentiful menu. I heard others say they thought the menu was limited, but there seemed to be quite a few options to me. Go late in the day, there may be a few sold out notations. I ordered the last of the sweet potato quinoa tacos and watched as they were removed from the menu. 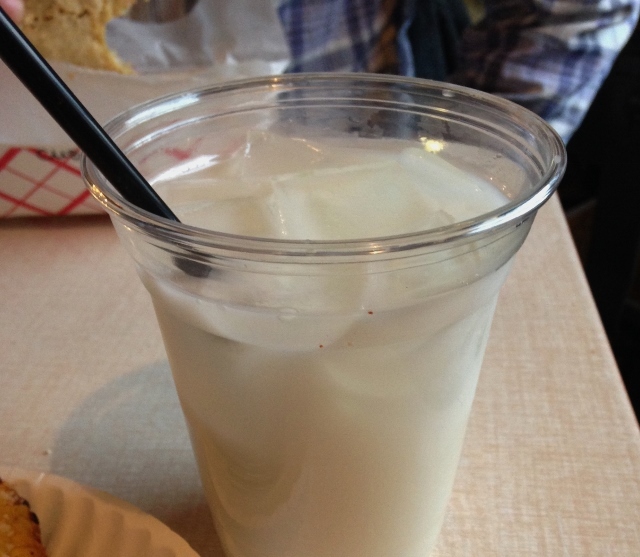 I also ordered elote, Mexican street corn or corn on the cob grilled and topped with cheese and paprika, and a house made horchata. I know as a food writer I’m supposed to pay attention to what my dining mates eat as well. 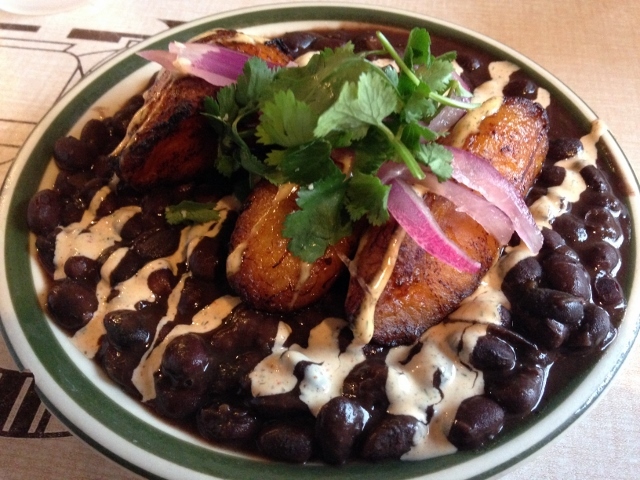 Beyond these incredible black beans with crema and maduros (sweet plantains), I have no idea what my favorite fella ate. It was something with gluten, so we couldn’t share it. Whatever it was he had, it must have been good because every time we found ourselves hungry on the remainder of our trip, he would suggest we go back to Mas Tacos. It really was that good. Oh, about those tacos…quinoa, sweet potato, jalapeno for just the right punch of heat topped with cabbage, chipotle salsa, crema and cilantro with a wedge of lime. If you want to see them prepared, here’s a video from Food Network. One of the best veggie tacos I’ve had in the U.S. Inside you’ll find a funky variety of tables topped with a roll of paper towels, multi-colored strands of lights hanging from the ceiling. The two guys at the table beside us were talking some pretty serious music business. The bench seating near the front door was occupied by a group of girls in heels tall enough to qualify as stilts. A lone fella with an impressive neckbeard and a trucker hat dining alone staked his claim on a four-top table. It was a fun mix of folks, with people watching almost as good as the tacos. Sure, it’s got a hole-in-the-wall feel to it but the food is excellent and it’s obvious everyone eats here. 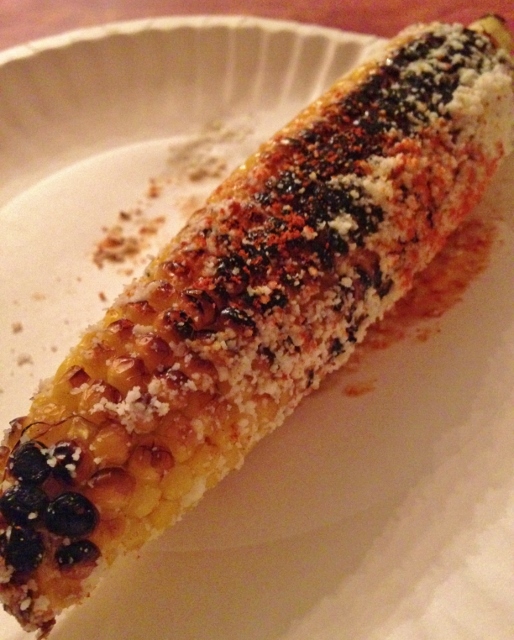 Kinda like the donut shop of the taco world. There is an outdoor seating area, but we were there during a cold snap so no one was out there, save for someone sneaking a smoke. I picture it being a fun spot on a warmer day. I had no problem finding something that worked for me here. I asked what was gluten-free. The day we were there, it was all of the tacos except the fried avocado. As with any restaurant visit, just make sure you ask enough questions to feel comfortable in knowing your needs are understood. 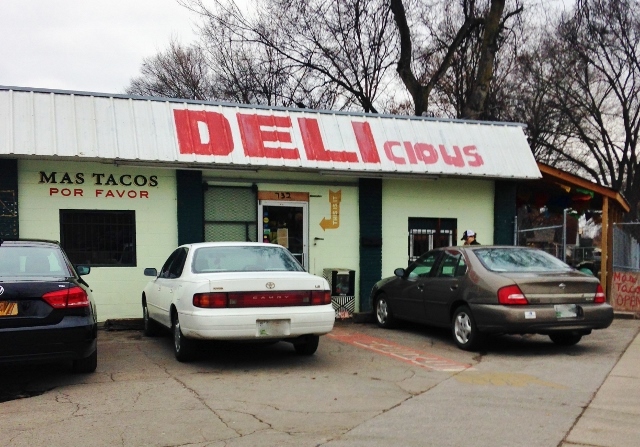 Mas Tacos Por Favor is located at 732 McFerrin Avenue in Nashville, Tennessee. 615.543.6271. Parking in the attached lot is limited, but there is nearby parking on the street. Check the hours before you head over, they are not open for dinner every night. *Writing bad reviews doesn’t feel good. Only in extreme cases (a total of two in five years) where gluten has been apparent in my food or the handling of my food restrictions was of great concern do I share anything less than a recommendation. I’d rather share a good recommendation with you. I hope that’s what you are looking for anyway, recommendations on where to dine. Thanks for understanding. I’m surprised you chose a taco with quinoa as you admitted recently that it’s not your favorite, but it and everything else looks great and sounds amazing! It was a fun place! I had the quinoa sweet potato tacos because they were the gluten-free veg option. And as much as I don’t really like quinoa, these were really, really good. Maybe I just need to learn to make quinoa differently? Ha! Nope, no cook-it-yourself here. 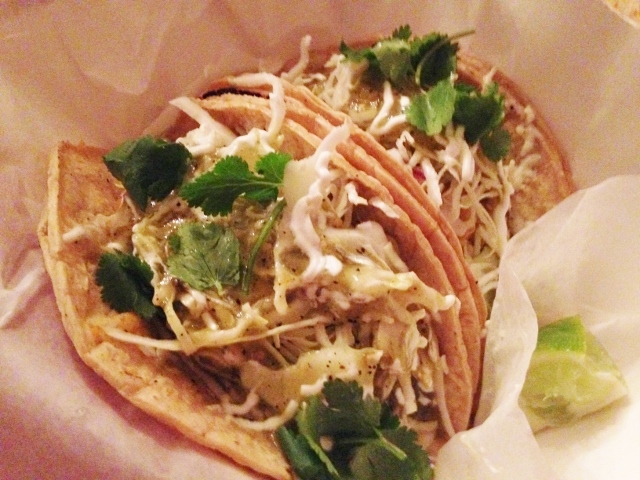 Just really great tacos in a funky little spot.